You’ll be amazed at how ridiculously delicious a 4€ plate of pasta can be at the Spanish Steps Pastificio. 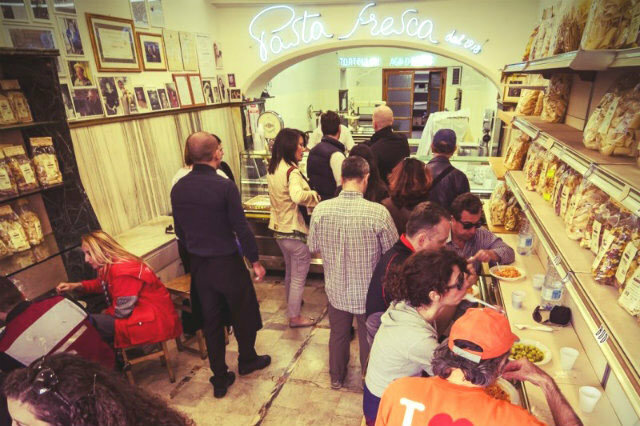 And you’ll be even more amazed at how you can still find a 4€ plate of pasta less than 200 meters from the Spanish Steps, one of Rome’s most important fashion districts. To be more precise, this business that has been running since 1918 is located on Via della Croce, 8. You have two choices: one has meat and the other one doesn’t. So if lengthy menus intimidate you, well, there isn’t much to read here: two choices, that’s all you get! Both are super savory, so it’s impossible to go wrong. They give you a generous portion of pasta, a fork, a napkin and water. They’ll even offer you a glass of wine if you ask them nicely enough. There is normally a line up during lunch time, and be advised that you eat your pasta standing inside or on the street. But not to worry, this place is a revolving door with people entering, eating and leaving as you are still creeping up to the front of the line. So there is a strong chance that you’ll find a little corner inside to have your meal on a colder winter day. The Spanish Steps Pastificio is truly a not-to-miss experience when in Rome! Don’t forget to get your shopping done, as they also sell to the public their homemade pasta at reasonable prices given its high quality. And the best part about the Pastificio’s location is that it is right across from Pompi, where you can skip on over for dessert: potentially the best Tiramisu you’ll ever have! So for under 10€, you’ll have had a complete meal. Don’t pass on this Spanish Steps Pastificio outing; it’s one that you’ll undoubtedly enjoy! Make sure to check out where to sleep near the Spanish Steps Pastificio here!